Fort Mountain hiking. Photo courtesy of Georgia Department of Natural Resources. Vogel State Park Trahlyta Falls. Photo courtesy of Georgia Department of Natural Resources. Vogel State Park hiking. Photo courtesy of Georgia Department of Natural Resources. Unicoi State Park hiking. Photo courtesy of Georgia Department of Natural Resources. General Coffee Trail Boardwalk. Photo courtesy of Georgia Department of Natural Resources. Mistletoe State Parks. Photo courtesy of Georgia Department of Natural Resources. Cloudland Canyon waterfalls. Photo courtesy of Georgia Department of Natural Resources. F.D. Roosevelt hiking. Photo courtesy of Georgia Department of Natural Resources. Fort Mountain hiking overlook. Photo courtesy of Georgia Department of Natural Resources. Fort Mountain hiking sunset. Photo courtesy of Georgia Department of Natural Resources. General Coffee hiking. Photo courtesy of Georgia Department of Natural Resources. Amicaloia Falls boardwalk ranger. Photo courtesy of Georgia Department of Natural Resources. Amicaloia Falls. Photo courtesy of Georgia Department of Natural Resources. Cloudland Canyon Overlook. Photo courtesy of Georgia Department of Natural Resources. Cloudland Canyon waterfall. Photo courtesy of Georgia Department of Natural Resources. Amicaloia Falls hiking trail. Photo courtesy of Georgia Department of Natural Resources. Black Rock Mountain State Park. Photo courtesy of Georgia Department of Natural Resources. Cloudland Canyon bridge. Photo courtesy of Georgia Department of Natural Resources. Black Rock Mountain sunrise. Photo courtesy of Georgia Department of Natural Resources. Black Rock Mountain. Photo courtesy of Georgia Department of Natural Resources. In North Georgia, hike across mountains with elevations ranging from sea level to elevations of more than 3,600 feet. In South Georgia, hike the coastal plains and along marshes. Georgia State Parks has more than 60 parks and historic sites across the state and this year celebrates its 85th anniversary. From the toughest climbs to the easiest strolls, including ADA-accessible trails, these parks offer hundreds of trails where hikers can find Georgia’s most beautiful landmarks including cascading waterfalls, canyons and mountain vistas. Beginner hikers can catch a spectacular view of Georgia, North Carolina and Tennessee from Black Rock Mountain State Park’s scenic overlook, and then drive down to Black Rock Lake for an easy 0.85-mile stroll on the Lake Loop Trail. Hikers will cross wooden bridges overlooking Taylor and Greasy Creek, and an 80-foot bridge spanning the southwest corner of Cricket Cove. At General Coffee State Park hikers can spot Gopher Tortoise burrows scattered along the sand hills on the Gopher Loop Trail. The trail meanders through Longleaf pines, oaks and wiregrass. Unicoi State Park’s Bottoms Loop Trail wanders through hemlocks, mountain laurels and rhododendrons, and blooming wildflowers in spring. A few brook crossings are easy to navigate and the second half of the two-mile hike follows along Smith Creek. F.D. Roosevelt State Park offers more than 42 miles of trails to explore, and the Pine Mountain Trail is the perfect setting for first-time backpackers. 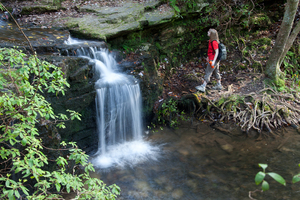 This 23-mile trail rolls over hills and wanders by cascading waterfalls and rolling creeks. There are 16 designated campsites along the trail for backcountry camping. Hikers looking for a challenge should check out the eight-mile Gahuti Trail at Fort Mountain State Park where stunning seasonal views await. Hikers can experience everything nature has to offer as they wind through hardwood forest and blueberry thickets, cross streams, and circle a glistening lake. Along the way, discover the stone fire tower built by the Civilian Conservation Corps and an ancient rock wall, which stands on the highest point of the mountain. The West Rim Loop Trail at Cloudland Canyon State Park is both enchanting and challenging, with five miles of trail. Beginning at the Daniel Creek Bridge, the trail climbs out of the canyon onto the canyon’s plateau, where hikers can see magnificent views of Trenton, Georgia. Those looking to scale the top of Amicalola Falls, explore the depths of Providence Canyon, brave the swinging bridge in Tallulah Gorge and master the staircase in Cloudland Canyon should become a member of the Canyon Climbers Club. Hike all four parks, get a card punched by rangers, and redeem it for a t-shirt and unlimited glory and bragging rights. To join, stop by one of four participating state park offices and purchase a $10 membership card. Membership cards are also available by calling 770-389-7401 or you may send an email with your name, address and daytime phone number to: [email protected]. Reach one of the most beautiful falls in the Southeast on the wheelchair-accessible West Ridge Falls Trail at Amicalola Falls State Park. 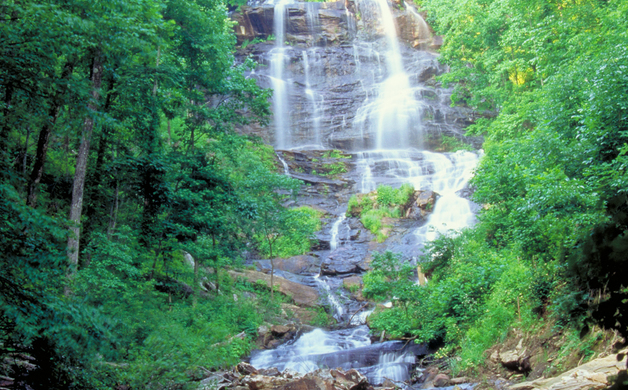 The 1/3-mile rubber-surfaced trail gently slopes before reaching the top section of Amicalola Falls, the tallest waterfall cascade in the Southeast at 729 feet. 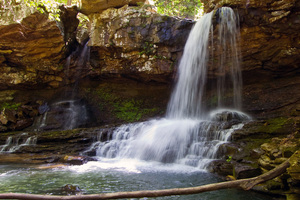 Mistletoe State Park’s rubber-surfaced loop trail, the Canyon Trail Loop, is a 1/3-mile and surprises hikers with a “canyon” which formed by water run-off from poor farming practices in the 1920s. On June 4, celebrate National Trails Day and Georgia State Parks’ 85th anniversary with special, ranger-led hikes at parks around the state. Find information on special programming at www.gastateparks.org. Take advantage of an extended stay to explore multiple trails while visiting Georgia State Parks. While pitching a tent at one of the Georgia State Parks is a popular activity, the parks still harbor secret camping and glamping spots and unique accommodations known only to those willing to travel off (or even above) the beaten path. Treetop camping, yurt glamping at six state parks, paddle-in camping to remote beaches, and backcountry camping offers a range of ways to stay in state parks all weekend long. Find your favorite accommodations atwww.gastateparks.org/reservations or by calling 1-800-864-7275. Information and photos provided by Alexa Lampasona, Pineapple Public Relations; courtesy of Georgia Department of Natural Resources & Georgia State Parks.